This Caribbean Smoked Ribs recipe delivers the most delicious BBQ ribs we’ve ever tasted and we’ve developed a method so that you can make them at home. NO SMOKER NEEDED! When most people make Caribbean BBQ ribs, they boil them for an hour or more first – to tenderize the meat and finish them on the grill. The problem with this method is that all of the flavor and moisture stays in that water you boiled them in. When you have Caribbean Smoked Ribs, the ribs are tenderized on the grill, no advance boiling. The result is a smoky, delicious rack of ribs with a crispy coating and moist, fall off the bone interior. While my wife loves the Caribbean Smoked Ribs that we first had in the Dominican Republic years ago – she was very skeptical of me coming up with an easy to make recipe that could duplicate the flavors. For the first time ever in our relationship I was right! This Caribbean Smoked Ribs Recipe delivers the best ribs you can get anywhere and you can make them on any BBQ. No need for a huge smoker that the average home cook doesn’t have access to. You don’t have to do anything special to turn your regular BBQ into a Caribbean Ribs Smoker. You’ll be cooking the ribs using indirect heat and placing a tinfoil pouch of wood chips over the “hot side” of the BBQ – easy as Caribbean Ribs! Smoking wood chips can be picked up at most hardware stores during BBQ season and BBQ specialty shops during the winter. I’ve even chopped up small pieces of kindling from regular firewood in a pinch (maple, mesquite, or any fruit wood is nice). 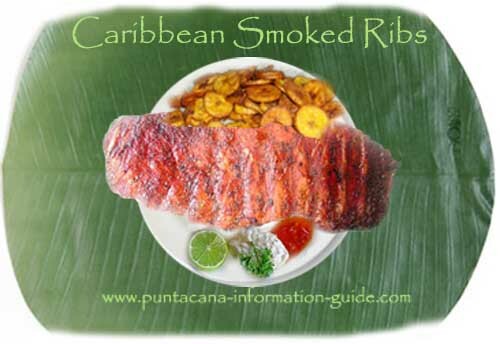 with this Caribbean smoked ribs recipe you can adjust the number of racks of ribs as needed. Mix all of the ingredients together for the rub and rub the mixture into the meat. Dividing the rub into two bowls is a good idea as you can store any leftover Caribbean Rub as long as it hasn’t been near the meat yet. Do be generous with the rub though, we want them covered. Take your smoking chips and dump about one handful of dry chips and another handful of wet chips onto a sheet of tinfoil (you want to make two of these pouches so double these instructions). Wrap the tinfoil pouch up so it’s sealed and then poke a bunch of holes in the top of it to let the smoke out. Make a good amount of holes – you want that smoke getting out! Open up your BBQ and place the tinfoil smoking pouch directly on the burner of one side and start the BBQ (only light the side that has the pouch on it). You want the BBQ at as low of a temperature as possible. Place the ribs on the gill of the “cold side” of the BBQ. They can overlap a little, but don’t smother any of them, you want the smoke to be able to get to them. Close the lid and don’t open it again. The ribs will stay in there for 3 – 4 hours. You should see smoke bellowing out of the BBQ after 20 minutes or so. When the smoke stops, open the lid and put in the new pouch. Leave ‘em for 3 or 4 hours and you’ll have the best Caribbean Smoked Ribs you’ve ever tasted. Cut the racks in half and serve them as you would any BBQ ribs. Using a very sharp chef’s knife, cut them into individual ribs and serve them as an appetizer. 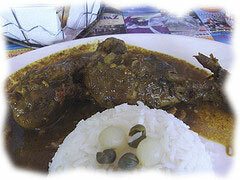 They make great Caribbean Party food and nobody ever serves them this way. Think of it, they’re the perfect finger food for your next Caribbean themed party.